July 7, 2017: With GST kicking in, prices of the Hyundai Xcent have been revised. Based on pre-GST taxes, the ex-showroom prices have gone down. Mumbai:The starting price for the sedan now starts at Rs5.35 lakh for the base variant, as opposed to Rs 5.56 lakh pre-GST. That's a reduction of Rs 21,000. Similarly, the top variant is now Rs 8,000 cheaper and costs Rs 8.43 lakh. Prices have been slashed across variants. Delhi:The starting price for the sedan now starts at Rs 5.33 lakh for the base trim, as opposed to Rs 5.38 lakh pre-GST. That's a difference of Rs 5,000. The top variant now costs Rs 8.39 lakh against the previous price tag of Rs 8.41 lakh. Prices have been slashed across variants. Do note that prices for insurance are marginally higher, as they are taxed at 18 per cent instead of the earlier 15 per cent. Hyundai Xcent prices start at Rs. 5.73 lakh for petrol and goes upto Rs. 7.80 lakh. The prices of Xcent diesel variants start at Rs. 6.65 lakh and the top-end diesel is priced at Rs. 8.73 lakh. Hyundai Xcent is available in 10 variants and 5 colours. Share your experiences with Xcent? The claimed ARAI mileage for the Hyundai Xcent petrol is 20 kmpl, and for the Hyundai Xcent diesel is 25 kmpl. The Xcent, unlike its hatchback sibling doesn't enjoy an upper hand over the competition but is still a well rounded package. With such a tempting price tag though, it looks like Hyundai has another winner on its hands. Q. Which has better value for money, mileage and safety among Honda Amaze, Hyundai Xcent and Toyota Platinum Etios? Q. I am confused between Suzuki Dzire ZDI and Hyundai Xcent CRDI SX, Which car is better? Q. Which is better Hyundai Xcent SX petrol or Ford Aspire Titanium? Q. How many kilometres after fuel filter is to be changed in Xcent diesel? Q. Which is best, Wagon R or Xcent? The Xcent follows the Grand i10's footsteps and sports a new face and a new diesel heart. Do the updates make a difference? We put the newly launched Ford Figo Aspire up against the Honda Amaze and the Hyundai Xcent to see if it has what it takes to be the new king of the segment. 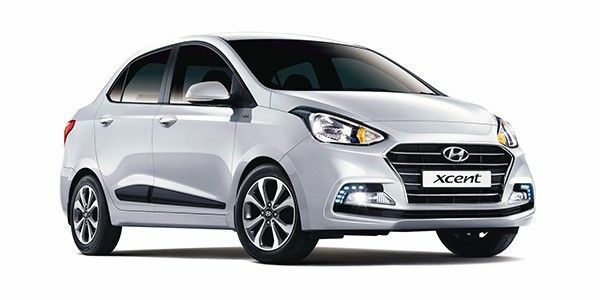 Rivalling the best-selling Maruti Suzuki Dzire, Hyundai is investing heavily on the Xcent and recently introduced its facelift version in Indian market. Based on the platform of Grand i10, the similarity between Xcent and Grand i10 is very much there though Xcent features stronger nose thanks to the use of large cascading grill upfront. The cabin of Xcent features a minimalistic design and the accuracy of panels stitching is the benchmark for the rivals. A 1.2-liter petrol and 1.2-liter diesel engine make the motive force in Hyundai Xcent up to the tune of 83PS/114Nm and 75PS/190Nm respectively. A 5-speed manual transmission is mated to both the motors while the petrol S variant gets the additional convenience of automatic. Retailed in the price bracket of Rs 5.39-8.42 lakh (ex-showroom, Delhi), the Hyundai Xcent has got Maruti Dzire, Tata tigor, Honda Amaze, and Ford Figo Aspire among others in its crosshairs. The design is not exactly outlandish. That said, it is well proportioned and looks better in the flesh than in photographs. The large hexagonal grille flanked by swept-back headlamps gives the Xcent a distinctive look. However, the inverted-L shaped DRLs placed around the fog lamps feels like an afterthought. Apart from the swanky 15-inch alloy wheels, the side profile has little to shout about. The rear is probably the best section of the car to look at. The new wraparound split taillamps blend in nicely with the dual-tone bumper, which has built-in reflectors, and the shark-fin radio antenna sits atop the rear windshield. In short, the three-box package has enough in its kitty to flaunt about. The dual-tone interior keeps expectations from a car of this size and price at bay. That said, it is one of the most sorted ones out there. The fit and finish is nearly on par with Germans and that’s high praise. Ergonomically, everything is placed where you’d expect it to be and the 7-inch infotainment supports Apple CarPlay and Android Auto. There’s automatic climate control on offer too, with a dedicated vent for rear passengers, which is quite effective. The low rear seating position isn’t as comfortable as some of its rivals and the narrow width doesn’t help either. However, at 407 litres, the boot space is plentiful to gallop enough stuff for a weekend getaway for four. Also, the absence of ABS in most of the variants gets a big thumbs down from us. That said, dual airbags come as standard in all variants. Where the petrol motor is buttery smooth, the diesel is equally gutsy. Both motors are 1.2-litre units, but while the petrol produces 83PS/114Nm, the diesel generates 75PS/190Nm. A 4-speed automatic or a 5-speed manual transmission is offered with the petrol engine. The diesel, on the other hand, is available only with a 5-speed manual gearbox. No points for guessing, it is the diesel that’s more frugal of the two. Its ARAI figure is rated at 25.4kmpl, compared to the 20.14kmpl for the petrol engine. Sure, the engines aren’t the strongest in the segment but they compensate by delivering one of the best fuel efficiency figures in the segment. The variant nomenclature reads E, E+, S, SX and SX (O). Further bifurcations amongst these variants cover the choice of automatic and manual transmissions and, metallic and non-metallic body paints. Let’s make it perfectly clear that the entry-level E variants aren’t recommended. The attractive price might lure you but it doesn’t have much to offer on the comfort, features or convenience front. If you’re after features like the fancy infotainment system, ABS and height adjustable driver’s seat, you’d need to start your evaluation from the SX variant. The range-topping SX (O) is where you’ll get features like 15-inch alloys, shark-fin antenna and automatic climate control. Honda Amaze: Honda’s workhorse is beginning to show its age. Despite the recent facelift, the Amaze fails to wow. That said, it still is among the most accommodating cars you can buy in this segment. Ford Aspire: The oldest car in this comparison, the Aspire remains the value buy in this segment for the space, performance and comfort it offers. The age does show through; the Aspire is the only car in the segment to not get a smartphone-compatible touchscreen infotainment system. It leads the pack in terms of safety though, with features like 6-airbags and emergency assist system. Maruti Suzuki Dzire: The new Maruti Dzire sits at the top of the compact sedan segment quite comfortably. The new generation has improved by leaps and bounds, and is among your best bets if you’re looking at a compact sedan. Tata Tigor: Tata’s new sub-4 metre sedan isn’t just great to look at, it also undercuts all its rivals in terms of price. The feature list is impressive too but the lacklustre powerplants let it down. And did you know it has a larger boot than the Hyundai Creta? Volkswagen Ameo: The Polo with a boot isn’t exactly a treat to the eye but the German build quality is certainly top notch. Plus, it is the only car in its segment to feature a 7-speed dual clutch automatic transmission, which comes mated to the most power diesel mill (110PS/250Nm) in the subcompact sedan category. If you want a balanced design, with a good feature list and equally commendable build quality, the Xcent is hard to falter. But if you aren’t a fan of how it looks or the weird seating position at the rear, and we appreciate that, your next stop should be a Maruti Suzuki showroom. Honda Amaze vs Hyundai Xcent vs Maruti-Suzuki Swift Dzire Diesel Comparison Review: In Pictures! 2014 Indian Auto Expo: Hyundai Xcent in Pictures! Hyundai Xcent: ABS Is Now Standard! Is the new Hyundai Xcent facelift better than the model it replaces? Following in the footsteps of the Grand i10 facelift, the Xcent facelift carries over cosmetic enhancements, added equipment and an updated diesel motor. Maintenance cost is average. Improve its wheels radius for more attractive looks of sedan car.